Global distributed power generation market expected to reach USD 103.28 billion by 2023, growing at a CAGR of 10.3% between 2018 and 2023. Distributed power generation is an approach that employs small-scale technologies to produce electricity close to the end users of power. The report covers forecast and analysis for the distributed power generation market on a global and regional level and country level. The study provides historical data from 2015 to 2017 along with a forecast from 2018 to 2023 based on both volume (MW) and revenue (USD billion). The study includes drivers and restraints for the distributed power generation market along with the impact they have on the demand over the forecast period. Additionally, the report includes the study of opportunities available in the distributed power generation market on a global level. In order to give the users of this report a comprehensive view on the distributed power generation, we have included a detailed competitive scenario and product portfolio of key vendors. To understand the competitive landscape in the market, an analysis of Porter’s Five Forces model for the distributed power generation market has also been included. The study encompasses a market attractiveness analysis, wherein product segments are benchmarked based on their market size, growth rate, and general attractiveness. 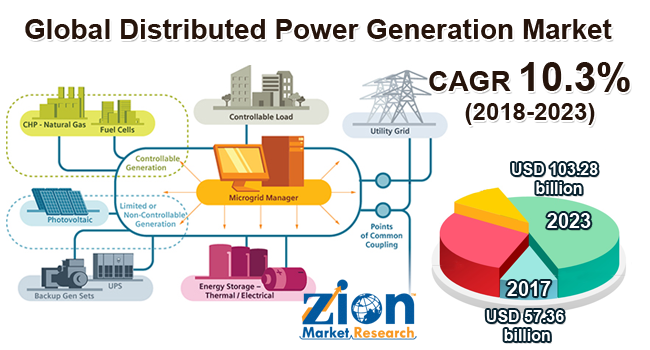 The study provides a decisive view on the distributed power generation market by segmenting the market based on type, sources, end use and regions. All the segments have been analyzed based on present and future trends and the market is estimated from 2018 to 2023. Key type segments covered under this study include on the grid and off-grid. On the basis of sources, the market has been segmented into the fuel cell, microturbine, solar PV and combined heat & power. On the basis of end users, the market has been segmented into commercial, residential, and industrial. The regional segmentation includes the current and forecast demand for North America, Europe, Asia Pacific, Latin America, and the Middle East and Africa. Each region has been further segmented into major countries such as the U.S., Canada, Mexico, the U.K., France, Germany, Russia, Poland, China, India, Japan, South Korea, ASEAN, Brazil, and Argentina. This segmentation includes demand for distributed power generation based on type, sources, and end-use in all the regions and countries. The report covers detailed competitive outlook including the market share and company profiles of the key participants operating in the global market. Ansaldo Energia, Ballard Power Systems, Bloom Energy, Capstone Turbine, Ingersoll-Rand plc, General Electric Energy LLC, Sharp Corporation, JA Solar Holdings Co. Ltd., Suntech Power Holdings Co. Ltd., Siemens AG, UTC Power LLC, and Yingli Green Energy.